While living out of State, my daughter told me over the phone that she was having sexual contact with someone back home. The second time we talked, she said she couldn't talk about it because the phone was "too hot" to use. I notified authorities and couldn't get anything done by telephone, so I drove to deal with it in person. On the way, as I was driving through my mother's retirement community, I saw a girl of 6-12 years old riding in an old classic convertible with a middle-aged driver on the right side of the front seat (the driver's side was on the right). As I met her gaze in passing, it looked like she was terrified - her body rippling in the wind with what seemed like involuntary spams, or contractions. It was the first indication to me that something was seriously wrong. I got a hotel room to consider the situation and after a couple good nights of rest, stopped at my mother's place to say hello before I left. I heard thumping under the stairs during my visit, and wondered what was going on. My mother packed a lunch, and talked me into leaving my trunk full of belongings to save fuel. I still don't know what was going on, but her trucker boyfriend was there, and the van driven by her old boyfriend who I knew to be dangerous was parked in the yard, so I chose not to challenge the situation and left. Years later, I was given bits and pieces from the trunk in disarray. On the way home, on a road mapped out by my mother's boyfriend, I saw two dogs sniffing what looked to be the eviscerated lungs and some of the entrails of a small person on the left side of the road. The remains were fresh. Blood had dried, but was running when the remains were placed. A triangular tear in the tissue of the lungs made it clear that the interior was still moist - green, but intact. They had not dried out, so they had not been there long. There was no noticeable odor, but two dogs were curious. A square torn out of a blue hospital gown with a circular Hospital Anesthesiologist logo on it, and a few tin cans laid beside the remains. I video taped the evidence, put the cloth in the trunk, and drove on to find what I believe was the rest of the eviscerated body hung by the neck from a three pole ranch gate. He, or she, looked like s/he had been hobbled, with socks on feet pointing straight down. Dressed in what looked like brand new clothes with smeared lipstick, and mascara drawn like a starburst around open eyes, a silent scream seemed to passed out of her. Her open eyes gave me the impression that she might be still alive, but because I had just videotaped what looked like her plural cavity a few miles before - and, because she was hanging by the twisted remains of her own esophagus and digestive tract, I did not stop to check life signs, I could not. It was clearly a dangerous situation. 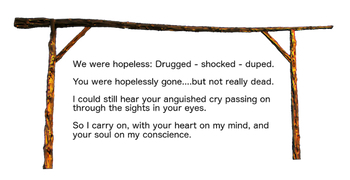 She hung lightly, seeming to drift and spin, haunting my gaze as I drove by. I had no working phone, but was gravely concerned about the situation, so with the videotape in hand, I drove on to get the information to the police. I stopped at a roadside bar to call 911. Perhaps due to the state of shock I was in, or because I wasn't clear or convincing enough, no one responded. Drugged as usual on tranquilizers, and in a state of shock, I stopped to change my underwear several times, and when I did, I found bugs on my clothes in the trunk. So I took the blue square torn out of the hospital Anesthesiologist gown, and put it a dumpster at a lakeside campsite, and returned to my drive home. And, as I did - while crossing a deep canyon, a howling of the wind buffeted me in the car, and a cloud of blackbirds descended on the horizon. I also remember an old grey pickup truck that followed me through the foothills that may have had as its passenger the same girl that seemed to warn me as I arrived at my Mother's place, but this time with a heavy-set bearded middle aged man. They turned towards the mountains in the east on a side road before I found the remains, and a Sheriff's squad car following during a short period of my return after the encounter, perhaps as a result of my call after finding the remains. The only time I can't account for at all during my trip was a short nap just after I crossed the boarder from my Mother's retirement community. I stopped to eat breakfast, and there was a laundrymat next door. I put the laundry in and took a nap in the car while I waited for the clothes to wash (the morning before the encounter and after driving all night), but I also found myself in another State after leaving the laundry-mat. I had to turn around after leaving the laundrymat, and head North to get back on my journey homewards. I also talked to the Authorities about the allegations my daughter made to me over the phone when I arrived; about the adult in her home sometime prior to my talk with my daughter. Though I did my best to relate what had happened - not only then - but also over recent years to anyone who would listen, it was clear that my efforts were inadequate and perhaps misguided. My daughter may not have chosen to share this information with others, and someone is clearly trying to avoid accountability for these crimes, so this document remains anonymous. What she shared with me was excitement about a permission normally denied by my the women of my faith. An investigation into my allegations was conducted two years later, and what I was told is that there was no one in the household who fit the description of the person who did so when they talked to her. And, that no disclosure was made by my daughter at the time of the investigation to confirm my report. I am in no position to compete with Investigators on this case or any other, but I have done my best to do all I can to own my own behavior, and report all I know online, and in person. I've kept names out of these documents for the safety everyone concerned. While I still have unanswered questions, I can't presume to do the work of Law Enforcement, or lead an investigation. I have to rely upon the Rule of Law, and Law Enforcement to do its job as it normally does. 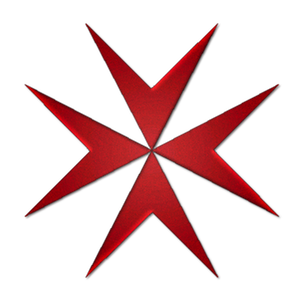 I've looked for strength and guidance to address the harm that has occurred, but what I've found is penitence and the inspiration I need from Orders, or Traditions like The Knights Hospitaller, who's obligations are reprinted here: Aspirations.